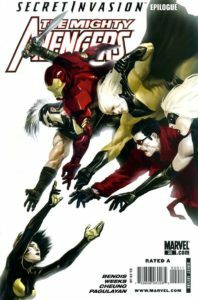 The definitive, chronological, and up-to-date guide and trade reading order on collecting Mighty Avengers comic books via omnibuses, hardcovers, and trade paperback graphic novels. A part of Crushing Krisis’s Collecting Avengers: A Definitive Guide. Last updated November 2017 with titles scheduled for release through July 2019. The original Mighty Avengers series emerges directly from the end of the Civil War event, which caused a schism in the Avengers. 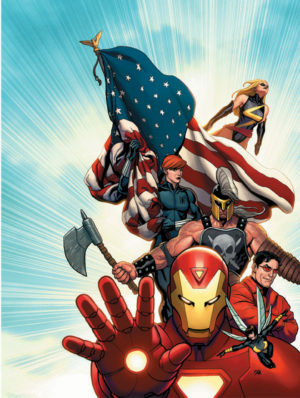 It featured an official, government-sanction team of Avengers sponsored by Iron Man and lead by Ms. Marvel. 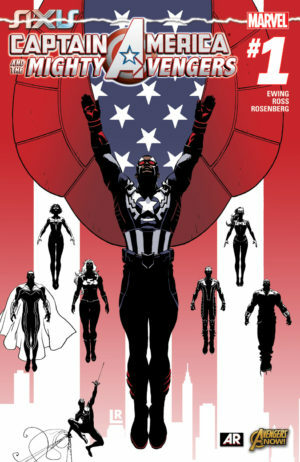 It’s also written in an intentionally nostalgic style to contrast with New Avengers, with narration and thought bubbles. 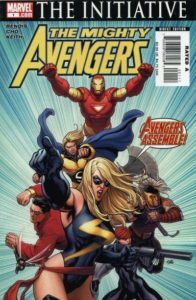 The title was dropped from the Marvel lineup for the Heroic Age in 2010 in favor of the pair of flagships, Avengers and New Avengers. However, it returned in 2014 during the Infinity event as a new, street-level team of brawlers. It was also a markedly diverse team focused on a number of black heroes. 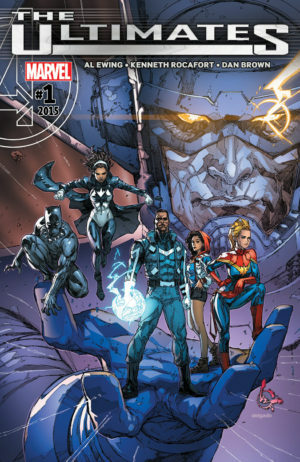 The senior core of the team – Spectrum and Blue Marvel – carried over to Ultimates in All-New Marvel Now, as did its commitment to increased representation for Marvel’s heroes of color with the additions of Black Panther and Ms. America Chavez to the cast (as well as Captain Marvel). Collects Vol. 1 and Vol. 2 from above. 12-issue maxi-series. This series occurs after at least the first arc of Mighty Avengers. Collects Vol. 3 and Vol. 4 from above. This run is also included in the Secret Invasion omnibus. See Marvel Universe Events: Secret Invasion for the oversize Secret Invasion event collections, including the Secret Invasion omnibus, which contains Mighty Avengers #7 & 12-20. Collects Vol. 5-7 from above, including the Requiem one-shot. See Marvel Universe Events: Siege for the oversize collection of Siege, which repeats some issues from the final Mighty Avengers oversize hardcover. Also collects Secret Invasion: Requiem. See Marvel Universe Events: Civil War for the story that leads to the launch of this team. A 12-issue maxi-series featuring the New Avengers and Mighty Avengers teaming up to assist the Invaders, displaced in time from the close of World War 2! This series occurs after at least the first arc of Mighty Avengers. This story is not written by Brian Bendis, so it is not referenced in the main Mighty Avengers series. Also collects Secret Invasion: Requiem. Available in hardcover (ISBN 0785138153). Available in hardcover (ISBN 0785148000). This could alternately be called “Prelude to Secret Invasion.” Collects Fantastic Four (1961) #2 [the introduction of Skrulls], Avengers: The Initiative (2007) Annual 01, The Mighty Avengers (2007) #7, and New Avengers: Illuminati (2007) #1 & 5. Beginning during Infinity, this title focuses on a diverse street team of Avengers. With a stellar art rotation of Greg Land and Valerio Schiti plus well-received writer Al Ewing, this unlikely ground-level team might have some legs. An Infinity tie-in; see Marvel Universe Events for more collection information. A relaunched title in 2014 with the title Captain America & The Mighty Avengers took advantage of the buzz around the new Captain America. Also includes the Secret Wars material Captain Britain & The Mighty Defenders #1-2 and the Age of Ultron tie-in Avengers Assemble 15AU. #8-9 also appear in Secret Wars: Last Days of the Marvel Universe oversize hardcover. See Marvel Universe Events for more information. The core of the Mighty Avengers team – Blue Marvel and Spectrum – continue to this book still written by Al Ewing and with a galactic scope. They are joined by Black Panther, Captain Marvel, and Miss America Chavez … plus, the biggest co-star of them all: Galactus! Check Amazon for Marvel’s newest Mighty Avengers and Ultimates titles.